Mrs. Caroline M. Carlson, 77, wife of Charles Carlson, of 343 North Williamson Road, Blossburg died Saturday, November 24, 1973, in Soldiers and Sailors Memorial Hospital, Wellsboro, following a lengthy illness. She was born at Depew, NY, August 29, 1896, a daughter of Mr. and Mrs. George W. Imer. Mrs. Carlson was a member of the Blossburg United Methodist Church. Surviving, besides her husband, are a daughter, Mrs. Dorothy Peppler of Tucson, Ariz.; two sons, Bernhardt of Massena, NY, and Charles of Lockport, NY. ; six grandchildren and eight great-grandchildren. The funeral was held Wednesday at Adams', 303 Main St., Blossburg. Burial was in Arbon Cemetery. The Rev. Guy W.A. Camp, her pastor, officiated. JACKSON - Clara Jackson Patterson, 77, of Wellsboro, RD 3, Pa., widow of Milo Patterson, Friday night, Nov. 12, 1954. She formerly taught in Tioga County schools for nine years and had been secretary of Charleston School Board for 15 years. Survived by daughters, Mrs. Howard Campbell of Wellsboro, Mrs. Kathryn Kennedy of Wellsboro RD 3, Miss Helen Patterson of Welfare Island, N.Y., Mrs. Esther McHuron of East Syracuse, N.Y. and Mrs. Bessie Brown of Prattsburg, N. Y.; son Foster Patterson of Wellsboro RD 3; sister, Mrs. Margaret J. Potter of Palmyra, Mo., several grandchildren and great-grandchildren. The body is at the Bastian & Kuhl Funeral Home, Wellsboro, where friends may call. Funeral there Monday at 1:30 p.m., the Rev. Marion Finch. Burial will be in Arbon Cemetery, Blossburg. submitted by grandson, James L.
JENNINGS, Lyman S. – Lyman S. Jennings, of Blossburg, died at the Blossburg hospital on Monday, March 10, aged 76 years. He was born March 2, 1843, in Covington. He had been in poor health of late and submitted to an operation at the hospital. The burial took place Wednesday afternoon, Rev. George Stott, pastor of the Methodist church, officiating; interment in Arbon cemetery. He was a veteran of the civil war and was a member of the Brown Post, G.A.R., of Blossburg. He is survived by two daughters, Mrs. Alta Cowley, of Blossburg, and Mrs. Henry Gribben, of Elmira, and two sisters, Mrs. Ida McIntosh, of Blossburg, and Mrs. Alta Youmans, of Wellsboro. Wellsboro Agitator, 19 March 1919. Mrs. Gertrude E. Erickson, age 76 of S. Williamson Road, Blossburg, died Monday, November 20, 1972 at the Soldiers and Sailors Memorial Hospital, Wellsboro. Funeral services were held at the Kuhl Funeral Home (formerly Shaw and Robena) Mansfield, on Friday afternoon. Rev. John Shypulefski officiated. Burial was in Arbon Cemetery, Blossburg. She is survived by husband, Oscar; one son, Harold of Apalachin, NY; one daughter, Mrs. Richard Spencer, Star Route, Mansfield; four grandchildren. She was a member of the Blossburg Baptist Church and the Blossburg American Legion Auxiliary. She was born June 10, 1896 in Covington Township, the daughter of Judson and Elizabeth Thomas Jessup. ALVIN J. (RASS) JOHNSON, 74, of 32 E. Union St., Canton died Sunday, June 9, 1985 at the Robert Packer Hospital in Sayre. Mr. Johnson was born Feb. 10, 1911 at Morris Run, the son of John and Lean Olson Johnson. He retired as an employee from Swayze Folding Box Co. in 1976. He was a member of the Silo Lutheran Church, Morris Run. Alvin and his wife, the former Catherine Arbogast, celebrated their 50th wedding anniversary on March 18. 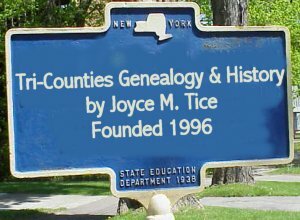 In addition to his wife, he is survived by a daughter and son-in-law, Barbara and Ronald Mix of Canton RD 1; a son and daughter-in-law, James and Anna Marie Johnson of Williamsport; seven grandchildren; seven great-grandchildren and two sisters, Olga Haglund and Velma Johnson, both of Blossburg. The funeral service will be held Wednesday at 1 p.m. at Morse and Kleese Funeral Home, 40 N. Center, St., Canton, with the Rev. O. Franklin Johnson, his pastor, officiating. Interment will be in the Arbon Cemetery, Blossburg. Friends may call at the funeral home Tuesday from 7-9 p.m. –Towanda Daily Review. Grant B. Jones, age 69 of Covington died Monday, Sep-tember 4th, 1972 at the Soldiers and Sailors Memorial Hospital. He was a veteran of World War II. Survived by wife, Martha El-lenberger Jones; sister, Mrs. Anna Dean of Blossburg; stepsons, Dean Clark of Oswego,, N.Y., and Douglas Clark of Stryker, Ohio; nine grandchil-dren; several nieces and nephews. Funeral services were held Wednesday at the Adams Fun-eral Home, Blossburg. The Rev. Maurice Entwistle officiated, Burial was In Arbon Cemetery. ROBERT M. JONES, 80, Blossburg, PA died February 22, 1996, at Soldiers and Sailors Memorial Hospital, Wellsboro. Mr. Jones was born February 11, 1916 in Wellsboro, a son of Morton F. and Harriet Stone Jones. He was a member of the Blossburg United Methodist Church and a veteran of the United States Navy; was very active in a number of community organizations and served on many of their boards. Surviving are his wife of 56 years, the former Marion McEwan; son and daughter-in-law, Dr. Robert M. and Cynthia Jones, Jr., Bluefield, VA; daughter, Carol J. Bond, Blossburg; five grandchildren, Marlon and (Thomas) Corsaro, York, Robert and (Carolyn) Bond, Morgantown, WV and Alexa, Jeremy and Maggie Jones, Bluefield, VA; one great-granddaughter, Lily Corsaro, York; and one brother, Morton F. Jones, Jr., Scotch Plains, NJ. The funeral and committal services were held February 24 from the William Zwicharowski Funeral Home, Blossburg, with the Rev. Archie Cruikshank, officiating. Interment was in Arbon Cemetery, Blossburg. Memorial donations in Mr. Jones’ name may be made to the Blossburg United Methodist Church, 108 N. Williamson Rd., Blossburg or to the Blossburg Memorial Library, 30y Main St., Blossburg. –Canton Independent Sentinel. Clyde M. Keagle, 83, of Arnot, died at 6 p.m. Tuesday, October 3, I972, at his home. He was born March 28, 1889, in Arnot, a son of Charles and Elnora Ridge Keagle. Mr. Keagle was a member of the Arnot Presbyterian Church. A retired blacksmith Mr. Keagle delivered mail daily to shut-ins and elderly people in the Arnot area. Surviving are his wife, the former Mae Lawson, three sisters, Mrs. Alice Lawson and Mrs. Frances Fleming, both of Blossburg, and Mrs. Anna Ro-bena, of Arnot; two brothers, Russel, of Blossburg, and Wesley, of Arnot, and three grand-children. The funeral was held Friday, at Shaw and Robena’s, 18 North Main Street, Mans-field, Burial was In Arbon Cemetery, Blossburg. The Rev. Frank Donaldson, his pastor, officiated. KOHLER –HELEN MACBLANE, 83, of Morris Run, died March 29, 2005. Born on Sept. 21, 1921, a daughter of Stephen and Christina Kohler. As a teen, Helen moved to Canton and during World War II, she worked as an operator for Canton Telephone Co. In 1945 she married James MacBlane and they shared 48 loving years until his passing in 1993. Helen’s faith in Christ guided her life. She was a caring woman, never having a bad word against anyone. Her love for family and home gave her much happiness and a special place in her heart was held for all her grandchildren. She was a member of Calvary Alliance Chapel, Canton. Surviving are her children, Marilyn (Lawrence) Gilbert of Canton, James Jr. (Joan) MacBlane of Blossburg and Thomas MacBlane (Susan Perry) of Morris Run; four grandchildren; James and Kimberly Gilbert and Lauren and Katherine MacBlane; and two great-grandchildren, Natalie Renee and Brittany Ann Gilbert. Friends may call from 7 to 9 p.m. Friday at the Zwicharowski Funeral Home, Blossburg. Services will be at 11 a.m. Saturday at the funeral home, with Rev. David McIntire officiating. Burial will be in Arbon Cemetery, Blossburg. Memorials may be made to Calvary Alliance Chapel, RR 2 Box 2112, Canton, PA. –Canton Independent Sentinel. KRAUSE Kenneth Charles Age 78, of Wellsboro, PA, and formerly of Painted Post, NY, died on Sunday, June 4, 2006, at the Carleton Care Home in Wellsboro, PA. Kenneth was born on June 3, 1928 in Wellsboro, PA, the son of Neil and Mabel (Stradley) Krause. Kenneth was a WWII U.S. Air Force veteran. He was a lifetime member of the Corning VFW having served as the Quartermater, enjoyed working their Bingo's for many years and was the team captain of area bowling leagues. Kenneth is survived by his mother, Mabel (Stradley) Krause of Blossburg, PA; a daughter and son-in-law, Laura and Thomas Rose of Wellsboro, PA; four sons and daughters-in-law, Stephen and Bonnie Krause of Soldotna, AK, Col. Lawrence and Marie Krause of Germany, David Krause of Corning, NY, Michael and Debbie Krause of Washington; grandchildren, Martha (Charlie) Lowe, Daniel (Rachael) Rose, Matthew Fay, Keri (Dennis) Dimmig, Gregory Krause, Brian Krause, Erick Krause, Kevin (Stacy) Krause, Lisa, Virginia (David) Barber, Erin (William) Taylor, Allison Krause, Miranda Krause, Grace Krause; several great-grandchildren; four brothers and sisters-in-law, Edgar and Alice Krause of Hemlock, NY, Neil Krause Jr. of Blossburg, PA, Allen and Mary Ann Krause of Rochester, NY, William and Judy Krause of Blossburg, PA. A daughter, Kaymi Taylor; a son, Keith Krause; a great-grandson, Andrew Cooper Lowe; and his father preceded him in death. Family and friends are invited to call on Tuesday, June 13, 2006, from 11 a.m. to 1 p.m. at the Jacquelyn A. Buckheit Funeral Chapel, Crematory & Monuments, PC, 637 S. Main St., Mansfield, PA. Funeral services will be held immediately following the viewing at 1 p.m. at the funeral home on Tuesday, June 13, 2006, with the Rev. Robert Greer officiating. Burial will be in Arbon Cemetery, Blossburg, PA, with Full Military Honors presented by Corning VFW. Memorial contributions may be made to the Kenneth Krause Memorial Scholarship Fund, Corning VFW, 281 Baker St., Corning, NY 14830. Mrs. Amelia(Emilie) Schultz, 67 of Blossburg, widow of Herman Schultz died at 6 a.m., Sunday, Aug 31 at the home of her daughter Mrs. Joseph Ballenger, at Aberville, S.C. Mrs. Schultz left Blossburg Aug. 26 to visit her daughter and was sick three days before her death. She came to Blossburg in 1907 from Germany and was a member of Advent church and former member of the Methodist church. Surviving are five daughters, Martha of Canandaigua, N. Y. ., Mrs. Lena Brown of Rochester, N.Y., Mrs. Mabel Powell of Endicott, N.Y., Mrs. Bertha Naylor of Blossburg, Mrs. Ballenberger; four sons, Alfred, George and Clarence, all of Blossburg. Arthur of Wellsboro; two sisters, Mrs. Minnie Hutcheson(? ), of Manty(? )- Clo(?) and Mrs. Anna Teller of Patton, twelve grandchildren and two great grandchildren. The body was taken to Blossburg Monday and funeral services were conducted at 2:30 p.m. Wednesday at the family home with Rev Ford Crippen(?) Methodist pastor, officiating, burial in Arbon Cemetery at Blossburg. LAMBERSON, Charles N., age 71, of Arnot, Pa., Monday, Sept 18, 1972 at the Soldiers and Sailors Memorial Hospital, Wellsboro, Pa. following an extended illness. Friends are invited to call at the Auld Funeral Home, Blossburg, Pa., Wednesday 2 to 4 and 7 to 9 p.m. Funeral there Thursday at 2 p.m. burial Arbon Cemetery, Blossburg, Pa. Survived by sons, Clarence Lamberson of Bentley Creek, Pa., Jack Lamberson of Wellsville, daughter, Mrs. Faye Bellinger of Blossburg, Pa.; brother Earl Lamberson of Morris Run, Pa.; sister, Mrs. Faye Jamieson of Morris Run, Pa.; seven grandchildren; seven great-grandchildren. Mrs. Margaret Carlson, age 79, of Blossburg, died on Saturday, November 18, 1972 at the Soldiers and Sailors Memorial Hospital in Wellsboro. Funeral services were held on Tuesday at the Arbon Cemetery with the Rev. John Shypulefski and the Rev. Maurice Entwistle officiating. Burial in Arbon Cemetery, Blossburg. Survived by sons, Howard of Williamsport, Pa., John of Horseheads, N.Y., William of Blossburg, Pa., Robert of Elmira, N.Y., and George of Valois, N.Y. and Oscar of Blossburg; 14 grandchildren; several great-grandchildren. Mrs. Carlson was a member of the Blossburg Baptist Church. Larry O. LEBLANC, age 52, of Troy, PA, formerly of Blossburg, PA died Monday, December 15, 1997 at home. Born March 14, 1945 in Blossburg, PA he was the son of Octave and Doris Ogden LeBlanc. Mr. LeBlanc was an industrial arts teacher for the South Williamsport High School. He was a member of the Blossburg United Methodist Church and attended the east Troy United Methodist Church. He was a member of the Hillside Rod and Gun Club in Blossburg, the PSEA and the NEA. Mr. LaBlanc was a talented woodworker. Surviving are his wife, the former Kay Greenough (1669 King St., Troy); a step-son, Jason Priest and a step-daughter, Kelley Priest Murray, both of Troy; a step-grandson, Jared Murray; step-daughters, Gabrielle Ulmer of Mansfield, PA and Judy Phelps of Chattanooga, TN; sisters and brothers-in-law, Roberta and Foster Marvin of Covington and Rebecca and Rick Fultz of Mt. Juliet, TN; three half-brothers; four nieces. Funeral services were held December 18 at the Blossburg United Methodist Church with the Rev. Mark Brower and the Rev. Archie Cruikshank officiating and interment to be in Arbon cemetery, Blossburg. Arrangements were handled by the Wm. Zwicharowski Funeral Home in Blossburg. Donations in Mr. LeBlanc’s memory may be made to the Blossburg United Methodist Church, PO box 17, Blossburg, PA 16912 or the East Troy United Methodist Church, RR 3, Box 457, troy, PA 16947. LEVACONT- Viel. Mrs. F.A. Viel, died suddenly at her home in Blossburg last Wednesday evening. At about 6:15, o'clock. Mrs Viel was talking to neighbors just outside her home. About 7 o'clock her son F. J. Viel, called at the home and found his mother dead on a lounge. The aged women had been in poor health for some time. Burial Arbon Cemetery, Blossburg. Death date April 27, 1922. LEWIS –MARGARET MACBLANE, 90, Morris Run, died January 10, 1984. She was born June 20, 1893, a daughter, of William and Mary Bennett Lewis. She was a member of the former Primitive Methodist Church, Morris Run. She was predeceased by her husband Thomas in 1974. She is survived by three sons Lewis and Thomas, both of Elmira, and James, Morris Run, two daughters, Mrs. Marion Lamberson of Morris Run and Mrs. Betty Blanchard of Elmira, twelve grandchildren; sixteen great-grandchildren. Funeral and committal services were held at the Drinkwine Funeral Home in Blossburg. Burial was in Arbon Cemetery, Blossburg. age 90 ,of Morris Run, PA, died Saturday, January 29, 2011 at Soldiers and Sailors Memorial Hospital, Wellsboro, PA. Born on August 23, 1920 in Morris Run, PA, he was the son of Otto and Ellen (Nybeck) Lindquist. He was preceded in death in 1978by his loving wife, Eleanor (Isban) Lindquist. He retired in 1982 after thirty-five years of employment with J.P. Ward Foundry in Blossburg, PA. In 1995 he became employed by Weis Markets in Wellsboro, PA where he worked until 2009. He honorably served his country during World War II as a member of the US Army 185th Infantry. He received decorations and citations for his role in the Asiatic Pacific Campaign, Philippine Liberation. He was a member of the American Legion, Post 180, Vienna, VA. He was Past Master of Masonic Lodge 350, F&AM, in Blossburg, PA. He is survived by two daughters, Karen Deming of Covington, PA and Susan Mozingo of Vienna, VA; sister, Phyllis Griffin of Mansfield, PA; brothers, Conrad and Robert Lindquistof Blossburg, PA; four grandchildren, Brett Deming, Lee Deming, Kelly Deming and Randy Mozingo; seven great grandchildren, Brandon Deming, Ellen Sember, Nicholas Deming, Lindsey Deming, Stevie Cleveland, Julia Ellen and Jack Otto Mozingo; two great great grandsons, Kaleb Richard Deming and Jason Sember; nieces and nephews; great nieces and nephews. Family and friends are invited to call on Tuesday, February 1, 2011 from 10:00 to 11:00 A.M. at the Jacquelyn A. Buckheit Funeral Chapel, Crematory & Monuments, PC, 637 S. Main St., Mansfield, PA. Funeral services will be held after the viewing at 11 A.M. at the funeral home with Pastor Michelle Somerville officiating. Burial will be in Arbon Cemetery, Blossburg, PA. In lieu of flowers, memorial contributions may be made in Alfred's name to the Blossburg Memorial Library, 307 Main St., Blossburg, PA. Funeral home obituary. LOUNSBERRY, Letson - Letson Lounsberry, of Corning, died Nov. 23 at the home of his son-in-law, Glen E. Witter, of Mossy Glen. Mr. Lounsberry was 82 years old. Death was caused by general infirmity, the deceased having been in failing health for 12 years. Letson Lounsberry was born October 8, 1837, son of Letson and Cynthia Lounsberry, of Canoe Camp, Richmond township, Pa. His parents were early settlers who were among the first to make a clearing in the woods of that section. In 1863, Mr. Lounsberry married Rosanna Gillette, of the same town, who survives. Of the six children born to them, four are living: Mrs. L.F. VanWey, of Elmira; Mrs. E.L. Witter, of Corning; Horace Lounsberry of Binghamton, and Harry Lounsberry, of Syracuse. The deceased was an engineer on the Erie trains running between Blossburg and Watkins from 1864 to 1888. He was in the Erie passenger service from 1888 to 1906, at which time he left the railroad on account of failing health. He had been a member of the Masonic fraternity since 1870. The funeral was held at the home of Glen E. Witter, of Mossy Glen last week Tuesday at 3 o’clock. Rev. D.E. Harlund, of the First Baptist church, officiated; burial in Blossburg. The burial rites were in charge of the Masons of Blossburg. Wellsboro Agitator, 3 December 1919. DAVID L. MACHMER, 53, of Canton RD, died Saturday, Nov. 20, 1976, in Robert Packer Hospital, Sayre, following a brief illness. He was born July 18, 1923, in Canton, a son of Fred and Mabel Mason Machmer. He was a farmer. Mr. Machmer was a member of Ward United Methodist Church, Canton RD. A member and former master of Bloss Lodge 350, F&AM, Mr. Machmer also was a member of the Williamsport Consistory and Irem Temple Shrine, Wilkes-Barre. He was a member of the Canton Moose Lodge and the Hillside Rod and Gun Club, Blossburg. Mr. Machmer was a Marine veteran of World War II. Surviving are his wife, the former Mary Lou Llewellyn; three sons, David L., at home, John of Elmira, N.Y., and Dennis of Millerton; two daughters, Tammy M. at home and Mrs. Donna Conners, of Elmira; his mother of Canton RD; four brothers, Lawrence, Paul, Russell and Mason, all of Canton, and four sisters, Mrs. Kathryn Ervaw, of Horseheads, N.Y., and Mrs. Leah Osipovitch, Mrs. Irma Earley and Mrs. Winifred Kutz, all of Canton. The funeral will be at 2 p.m. Tuesday at Auld’s, 120 North Williamson Road, Blossburg. Burial will be in Arbon Cemetery, Blossburg. The Rev. Raymond D. Fravel, his pastor, will officiate. Friends may call at the funeral home from 7 to 9 tonight. –Canton Independent Sentinel. Margerie Manikowski Age 86, formerly of Morris Run, PA, died while surrounded by her loving family on June 14, 2006 at her daughter's home in Mansfield. Born in Blossburg on September 26, 1919, Margie was one of 10 children of Louis and Margaret (Dreas) Manikowski. Margie was a faithful and active member of St. Joseph's Catholic Church and their Altar and Rosary Society. She enjoyed playing bingo, sewing, going for walks, and in her earlier years loved fishing. She will be fondly remembered for her willingness to always help others. Her main interest in life was the love shared with family, especially her grandchildren. Surviving are her children, Jackie (Jack) Reppard of Nokomis, FL, Margie (William) Love of Mansfield, and William (Ruth) Payne of Arnot; three grandchildren, David and Denise Love, and Johnathan Payne; a great-grandson, Seth; three sisters, Monica Hughes and Martha (Tom) Jessup, all of Lawrenceville, and Angie Bubacz of Blossburg; many nieces, nephews, cousins, and dear friends. She was predeceased by her beloved husband, David on Jan. 8, 1995; a sister, Marcella Soporowski; brothers, Louis, Moe, Raymond, Leo, and Matt Manikowski. Friends may call 6:00 to 8:00 p.m. Friday (this evening) at the Zwicharowski Funeral Home, Blossburg, with a vigil at 8:00 p.m. Transferal prayers will be held 9:30 a.m., Saturday at the funeral home, followed by the Mass of Christian Burial at 10:00 a.m. at St. Joseph's Catholic Church in Morris Run, PA, with Father Joseph Hornick officiating. Burial will follow in Arbon Cemetery. Memorials in Mrs. Payne's name may be made to Laurel Home Hospice, 24 Walnut St., Wellsboro, PA 16901, or BACC, 138 St. Mary's St., Blossburg, PA 16912. Samuel J. Martin, 92, a resident of Broad Acres Nursing Home in Wellsboro, formerly of Covington, died Monday, September 7, at the nursing home. Born March 13, 1895 in Morris Run, he was the son of Robert B. and Margaret Judge Martin. He was a retired electrician, a retired superintendent of Morris Run Coal Mining Company, and a World War I Army veteran. Mr. Martin was a member of the Covington Baptist Church, an over 50 year member of the Blossburg Lodge #350 F.and AM, and a member of the American Legion, Blossburg. Surviving are his wife of 67 years, Hannah Jenkins Martin; three sisters, Roberta J. Martin, Isabel P. Martin, and Mrs. Edith M. Shoenfeld, all of Trenton, NJ. ; and several nieces and nephews. There will be no visitation. Funeral services will be held Thursday, September 10, at 11 am at the Covington Baptist Church. The Rev. John R. Truax will officiate. Burial will be made in Arbon Cemetery in Blossburg. Arrangements were made by Tussey-Mosher Funeral Home, Wellsboro. MASE Thelma W. Age 82, of Pine City, NY, born November 5, 1922 - died October 9, 2005. Thelma lost a courageous battle to cancer with grace, dignity, and a strong spirit. She was the foundation and the heart of the family. Her smiles, open arms, wisdom, and generosity welcomed you at her doorstep, with no judgment and with unconditional love. She was predeceased by husband, Milton "Jack" Mase; brothers, Barney and Duke Sechrist; and Heather Mase, Emily Stalis, and Richard J. Stalis. She graduated from Liberty H.S. in 1939 with highest honors. Survived by sons, James W. (Rena) Mase of Pine City, Milton Joseph (Mary) Mase of Pine City, John C. (Janet) Mase of Pine City, Jerome L. (Donna) Mase of Southport, Jeffrey L. (Brenda) Mase of Pine City; daughters, Jacalyn R. (Bucky) Peel of Painted Post, Jennifer N. Edwards of Painted Post, and Joy L. (Ermen) Paulo of Elmira Heights; brothers, Don (Shirley) Sechrist of Williamsport, PA, Robert (Virginia) Sechrist of Williamsport, PA; and sister, Mildred Brown of PA. She has 28 grandchildren, 38 great-grandchildren, and three great-great-great-grandchildren. She will be missed by all. Friends are invited to call at the Olthof Funeral Home, Inc., 1050 Pennsylvania Ave., Elmira, NY on Wednesday, October 12, 2005, from 2 to 4 and 6 to 8 p.m. A Funeral Service will be conducted there Thursday at 10 a.m. by Pastor Richard Hack. Burial in Arbon Cemetery in Blossburg, PA, will be at the convenience of the family. Donations may be made in memory of Thelma to St. Joseph's Hospital Foundation, 555 E. Market St., Elmira, NY 14901. Jennie J. McLean Age 101, Formerly of Elmira, NY, born November 18, 1899 the daughter of John and Jannie Pequignot McLean, diedat Elcor Health Services, Horseheads, NY on Friday, October 26, 2001. It was Jennie's request that there be no calling hours. At the convenience of the family, a private Funeral Service will be held at Olthof Funeral Home, Inc. 1050 Pennsylvania Ave. with Rev. William Vallet officiating. Burial will take place in the Arbon Cemetery, Blossburg, PA. Jennie was predeceased by: her husband Fred Bryant in 1959 and a son Harold in 1934. She is survived by sons and daughters-in-law, Wayne and Ann Bryant of Horseheads, NY, Fred and Dorothy Bryant of Palm Harbor, FL; 3 grandchildren; Steve Bryant of Eldersburg, MD, Carol Bryant of Elbridge, NY and David Bryant of Horseheads, NY; 2 great-grandchildren, Mark Bryant of Eldersburg, MD and James Bryant of Elmira, NY; and niece Kathleen of Canton, PA. Jennie was a member of the Pennsylvania Avenue United Methodist Church for over 65 years. Family will provide flowers. Memorial donations can be made in Jennie's name to a charity of one's choice. Joseph John Mesuch, 70, of Morris Run, died Tuesday, Feb. 26, 1974, at his home following a lengthy illness. He was born Jan. 15, 1904, at Morris Run, a son of Stanley and Agnes Smith Mesuch. Mr. Mesuch was a retired miner and a retired employe of the J.P. Ward Foundry, Inc., Blossburg. Surviving are his wife, the former Emma Carew; two daughters, Mrs. Peter BeLosa, of Mansfield, and Mrs. Philip Jeneski, of Wellsboro; two stepsons, Ernest Johnson, of Mainesburg, and Charles Johnson, of Blossburg; three brothers, Bernard of Blossburg, Walter, of Pine City, NY, and Steve, of Allentown; a sister, Mrs. Martha Robakowski, of Arnot, and five grandchildren. The funeral was held Saturday morning at Auld's, 120 North Williamson Road, Blossburg, with further services in Arbon Cemetery, Blossburg. The Rev. Emil Hussak officiated. MESUCH, Joseph John, age 70 of Morris Run, Pa., Tuesday, February 26, 1974 at his home after an extended illness. Friends are invited to call at the Auld Funeral Home, Blossburg, Pa. Thursday and Friday from 7 to 9 p.m. Prayer services at the funeral home Saturday at 9:30 a.m. followed by gravesite service at the cemetery. Rev. Emil Hussak officiating. Burial in Arbon Cemetery, Blossburg, Pa. Vigil service at the funeral home Friday at 8 p.m. Survived by wife, Emma Carew Mesuch; daughters, Mrs. Peter (Peggy) DeLosa of Mansfield, Pa., Mrs. Phillip (Betty) Janeski of Wellsboro, Pa.; stepsons, Earnest Johnson of Mainesburg, Pa., Charles Johnson of Blossburg, Pa.: brothers, Bernard Mesuch of Blossburg, Pa., Walter Mesuch of Pine City, Steve Mesuch of Allentown, Pa.; sister, Mrs. Martha Robakowski of Arnot, Pa.; five grandchildren. Mrs. Margaret M. Rockwell, 74, of 141 North Williamson Road, Blossburg, died Thursday, August 16, 1973 at her home. She was the widow of Dr. Edwin Rockwell. She was born in Blossburg on December 5, 1898, a daughter of Nathaniel and Mary Blair Mitchell. Mrs. Rockwell was a graduate of Blossburg High School and a graduate of the Sargent School of Physical Education at Boston, Maine. She is survived by two sisters, Mrs. Susie Gaffy of Buffalo, NY and Miss Esther Mitchell of Baltimore, Md. Rev. Maurice Entwistle officiated at funeral services at the Adams Funeral Home and committal services at Arbon Cemetery at Blossburg on Sunday, August 19th. Cornelia M. Rennie, of 14 N. Main St., Mansfield, died Wednesday, January 9, 1974 in Soldiers & Sailors Memorial Hospital, Wellsboro. Funeral services were held on Saturday at 10 am at St. James Episcopal Church in Mansfield. Rev. George Booth officiated. Burial in Arbon Cemetery, Blossburg. There was an Eastern Star Service at the Kuhl Funeral Home Friday evening at 9 pm. She has no known survivors. She was a member of St. James Episcopal Church, Mansfield, member of the Eastern Star, Twilight Chapter No. 475, Mansfield, member of the American Legion Auxiliary. She had been associated with Finesilver's Dress Shop in Mansfield for 47 years at the time of her retirement in 1969. She was the daughter of Mr. and Mrs. Cornelius Moore. Age 49, formerly of Blossburg, PA, died Saturday, May 26, 2007, in Everton, AR. Family and friends are invited to call on Monday, June 11, 2007, from 2 to 3 p.m. at the Jacquelyn A. Buckheit Funeral Chapel, Crematory & Monuments, PC, 637 S. Main St., Mansfield, PA. A Memorial Service will be held immediately following the visitation at the funeral home at 3 p.m. with the Rev. Richard Berg officiating. Burial will be in Arbon Cemetery, Blossburg, PA.
Miss Elizabeth Munro, Altoona, a native of Morris Run, died Sunday morning, March 27, 1960, at the Altoona Hospital. She was 80. Miss Munro was a receptionist and Housekeeper at the Altoona Hospital for 26 years before she retired in 1958. She was the daughter of Neil and Elizabeth Whammond Munro. Her only survivors are a niece, Miss Christine Martin, and a brother-in-law, Charles Martin, with whom she made her home. She was the aunt of Mrs. Gladys Bradza and Mrs. Betty Denung, both of Blossburg. Services were held at 11 am Wednesday at Blossburg. The Rev. Herbert Hoskins, pastor of the Blossburg Methodist Church officiated. Burial was in Arbon Cemetery.